In the spring, we outlined how manufacturers were reinventing the ATI Radeon 5870 GPU. 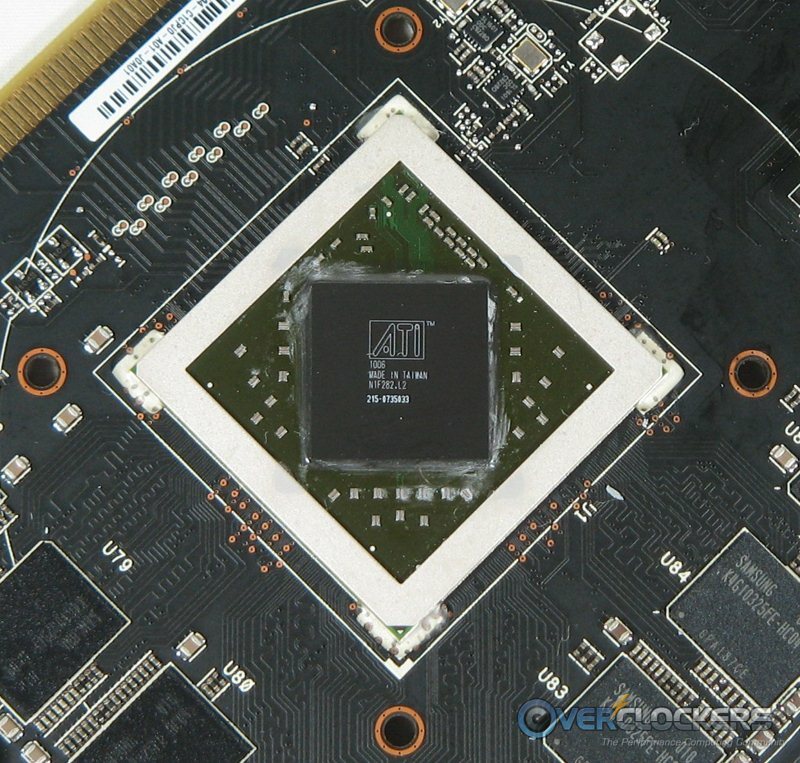 MIAHALLEN gave us an in-depth look at Gigabyte’s offering, the 5870 Super Overclock (SOC). 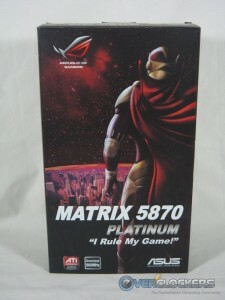 We’re back with another such unit today, in the form of the ASUS Matrix 5870 Platinum. Author’s note: There was an oversight in the initial article on the feature of BIOS flashing via the iTracker software. That oversight has now been corrected. 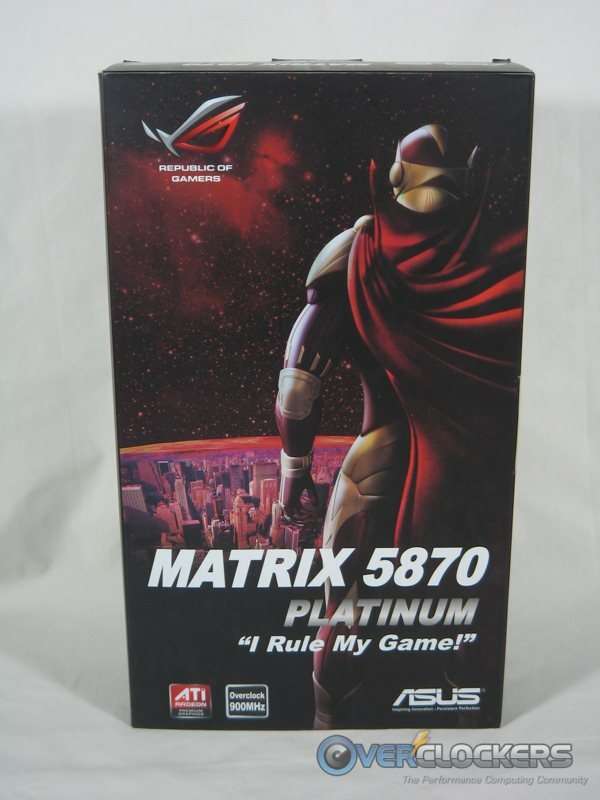 The Matrix Platinum is no ordinary 5870. 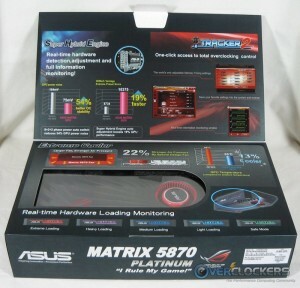 First, the core clock is overclocked from the 5870’s normal 850 MHz to 894 MHz. The memory clock stays the same at 1200 MHz (4800 MHz in quad-pumped ASUS-speak), but they have equipped this monster with 2 GB of memory. It’s not alone amongst the 5870s with regard to the amount of memory, but it stands all by itself in being a stock-overclocked 5870 with that much. The 5870 reviewed by MIAHALLEN has faster core (950 MHz) and memory (1250 MHz) speeds, but only 1 GB of RAM. Great sounding specs to start the review off right. The biggest deals are the GPU clocks (894 MHz stock) and the amount of GDDR5 – two gigs! Let’s take a gander at the card itself. Like we saw in the Crosshair IV Formula (CIVF) review, ASUS sure knows how to package its products. Also, like the CIVF, there is a top flap that opens up to a window displaying the product itself along with some shiny marketing stuff. Pulling the card out, we see it’s sheathed in a protective foam layer to keep it nice and secure in its travels. 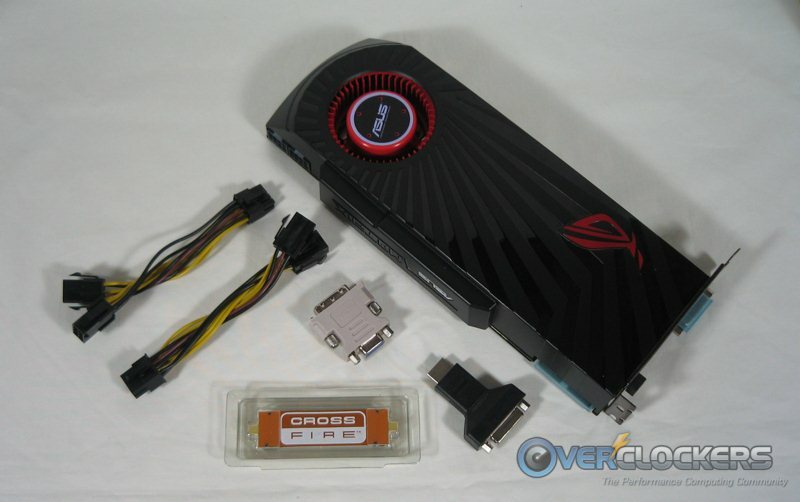 The card comes with two dual 6-pin to 8-pin power adapters, a DVI-to-HDMI adapter, a DMI-to-VGA adapter and a crossfire bridge. 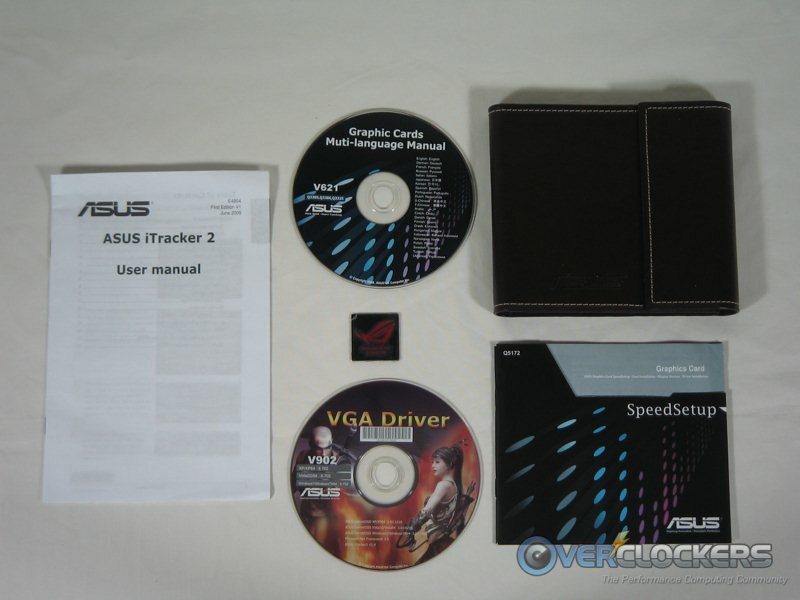 Also included are driver discs, a case badge, the manual and a CD / DVD case of all things. It’s nice, but was a surprise. What’s missing here is a game. 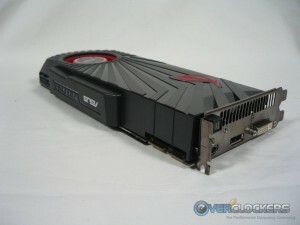 Lots of high-end video cards come with a current title (though Dirt 2 may not be on everyone’s must-have list). Not a huge drawback, but freebies are always nice. More pertinent to the card: some of you may notice there wasn’t an anti-static bag around the card. 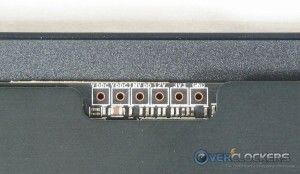 However, all connectors are covered in tight-fitting plastic. The card looks very nice. Sleek and understated, it would compliment pretty much any system well. In case anyone hasn’t noticed, I enjoy being thorough when taking photos for reviews, so here are a bunch! Ok, enough gratuitous photograph taking. There are a couple fun things to note before moving on. 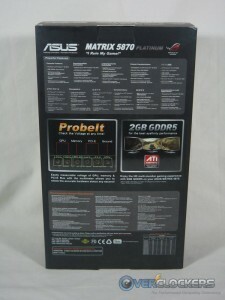 First is the ASUS ProbeIt voltage read points conveniently located on the top of the card (when installed). 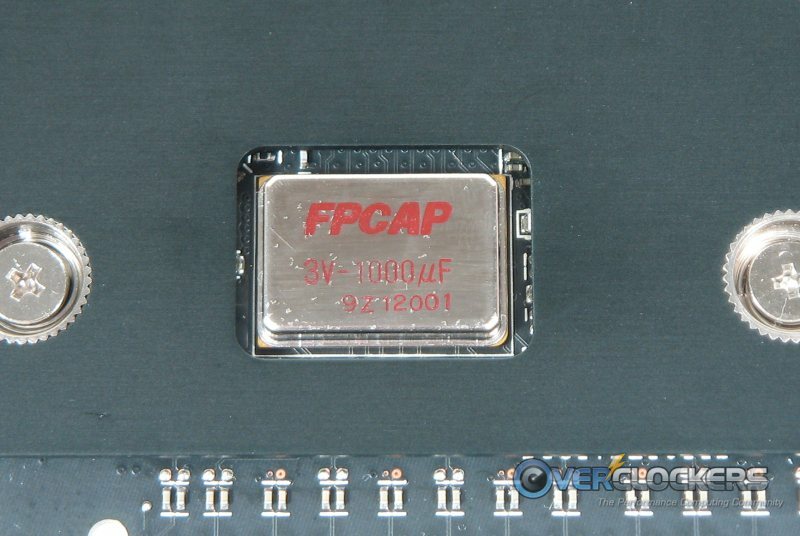 Also prominent through the metal backplate is a strong 1000 μF capacitor to help stiffen the card against voltage dips and (in theory) give you better overclocking stability. Now that we’ve seen the card from all sorts of angles, let’s open this thing up. Configured in a similar fashion as the stock coolers, this is most definitely not your average stock cooler. 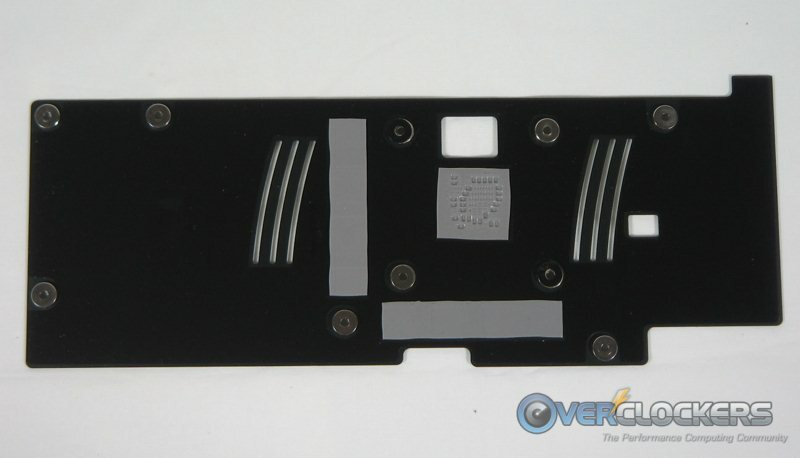 There is a backplate to help dissipate heat from the back of the GPU socket as well as from the RAM on the back of the card. The cooler itself is a direct-contact heatpipe solution attached to aluminum fins. 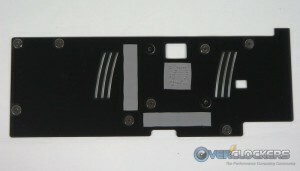 The thermal paste pattern and thermal pad imprints both showed good contact throughout. While most cards with heatsinks like this have one electrical connection, this one has two. One is for controlling the fan and the other is for the Matrix logo on the outside-facing side of the card. This logo lights up, and is a pretty neat addition actually. When the computer is turned on, the logo will change colors depending on the load it is under. My camera is not co-operating and refuses to take accurate color photos in the dark, so here is the color spectrum from ASUS. While that doesn’t affect performance at all, it sure looks nice through a case side panel window! Since we’ve got the card all naked, we should take a peek before putting the cooler back on. As you can see, there is a lot to cool on this card. Combined with the heat-dissipating back plate, the cooler is definitely up to the task. 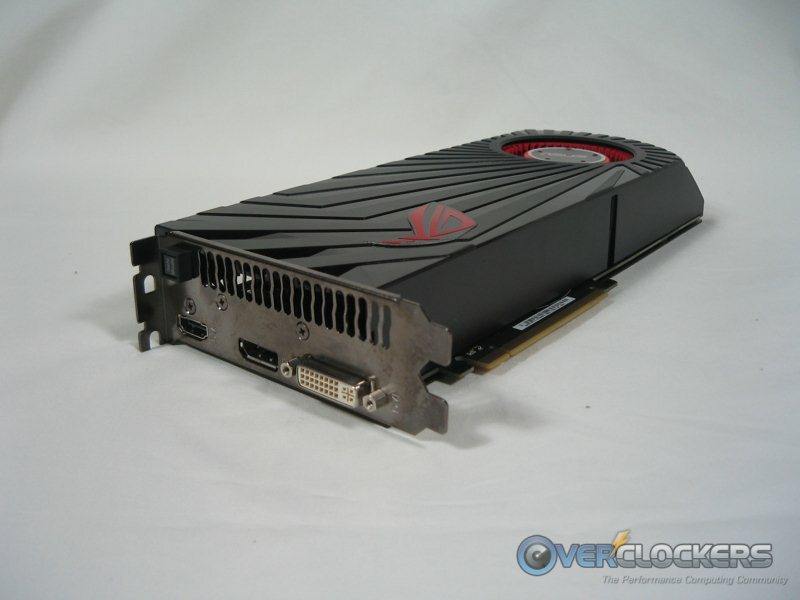 While it is very, very far from quiet – had I not known it was impossible to blow a water cooled computer across the room, this card would have made me fear that occurrence – it does a good job of cooling the card. With an ambient temperature in the room of approximately 24° C and the fan set at 75% (about the loudest a normal person could tolerate for long periods of time), here are a couple temperature results after running Furmark long enough to let the temperature equilibrate. The overclocked result was with the GPU at stock voltage and a 946 MHz core clock. The cooler is certainly up to the task and would even allow some voltage increases if you want to explore that for 24/7 use. This will be a quick section of the review because we’re here to bench, not save the planet. It never hurts to be a little eco-conscious though, so let’s see how this offering fares. These tests were only run at stock clocks. If you’re really concerned about power consumption, you’re probably not going to be overclocking (and thus drawing more power) for everyday use. For comparison, we’ll look at a top of the line card from the previous generation – a HIS 4890 Turbo. Values were measured using a Kill-a-Watt on the system used for testing below. 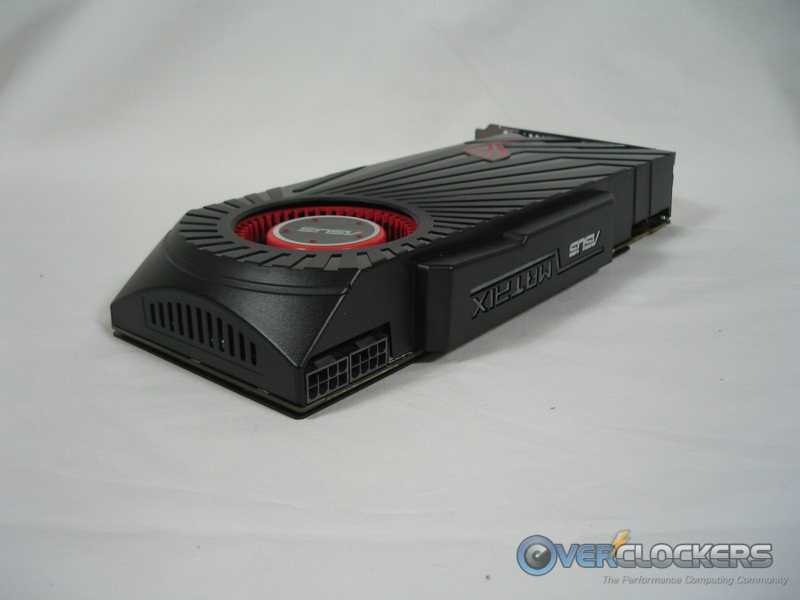 The only difference was the video card. 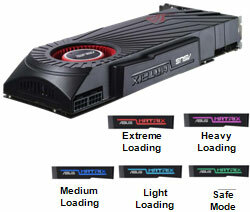 While the Matrix pulls thirty-four more watts under load, you save twenty-seven watts at idle. This is the state where your GPU will likely reside most often, so this isn’t bad at all considering the upgrade. It’s also important to note that the 5870 possesses 2 GB of RAM, rather than the 1 GB on the 4890. 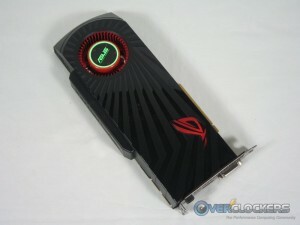 Now let’s see what ASUS has in store for us to push this card a bit. 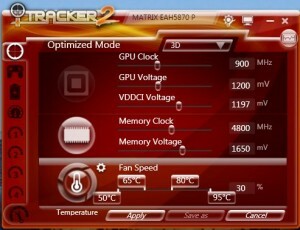 Much like the TurboV EVO software on their CIVF, iTracker is a very solid piece of software for overclocking this card. The first window we’re met with lets you go to town on the main settings straight away; frequency, voltage and fan control are right at your finger tips. On the left you see eight selectable presets, four of which are pre-determined and four of which are user set. 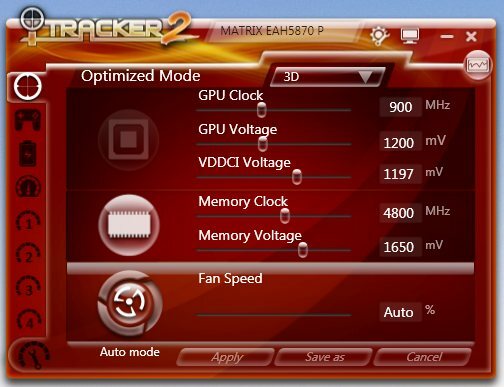 By default, iTracker 2 will automatically set your GPU at 900 MHz, which is the only change from stock. Why they didn’t just make the default clock 900 MHz instead of forcing you to use software is beyond me. This automatic setting of the overclock occurs as soon as the software is loaded when you boot up. Unfortunately, this can lead to a very serious software problem when testing a GPU – namely an untimely death for a Windows installation. Picture this: You get all excited – you have a brand new card in and you start to overclock it. You set the voltage up a little bit and decide to shoot the moon (1 GHz) without really feeling out the card. Instantly, the computer locks up. 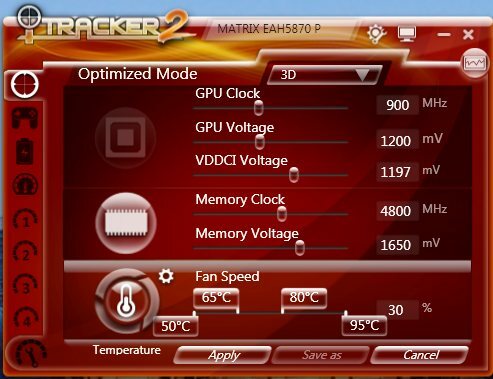 Typical of GPU overclocking, so you restart, right? Well, with this software it led to a horrible restart loop. Boot up, put in password, load startup items including iTracker 2, lock up. Rinse and repeat a few times and your Windows install will go down really quick being interrupted so much before it completes booting up. Yep, I did all of this. Booted into safe mode, uninstalled iTracker and went back into Windows. No lock up this time, but something very untoward happened to the OS forcing a complete reinstall. Let this be a lesson – turn off the auto-setting of your overclock on boot before trying for high clocks! ASUS is not alone, and most GPU software will do this by default. As such, this is an admittedly stupid mistake, but this goes to show it can happen to anybody. Don’t let that anybody be you. The software was just doing what it was supposed to and I do not blame ASUS for my idiocy; I just wanted to tell this yarn as a cautionary tale. There is a “Safe Mode” button on the card that is supposed to prevent this kind of thing by telling the software not to load the last OC settings. Unfortunately it never worked for me; the software always set the clocks, safe mode or no. So don’t count on “Safe Mode” coming to your rescue. Moving on, the fan can be allowed to remain on auto, set manually or be temperature controlled, like the image below on the left. The screenshot on the right is the “about” window in the software showing hardware and software info. 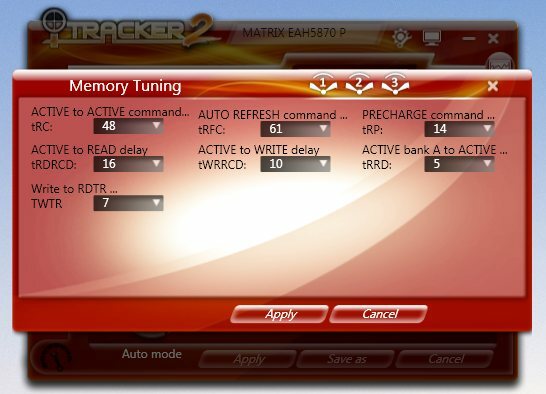 Now we are brought to the exciting part of the iTracker 2 program – memory settings. You see that big button with what looks like an IC in the middle of it? When clicked on, you are met with settings you won’t see available with any other graphics card manufactured today – graphics card memory timings! Those of you that enjoy tweaking are going to have a blast with this one. Time didn’t allow for me to fully explore this for the review, but suffice it to say you could spend a lot of time tweaking this card to get the most out of every MHz, or just to add more MHz. 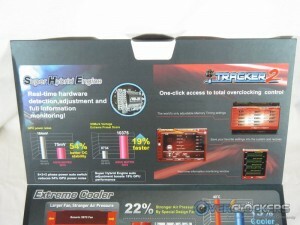 There are three presets – default, performance & overclocking – but all of the timings are also individually selectable. 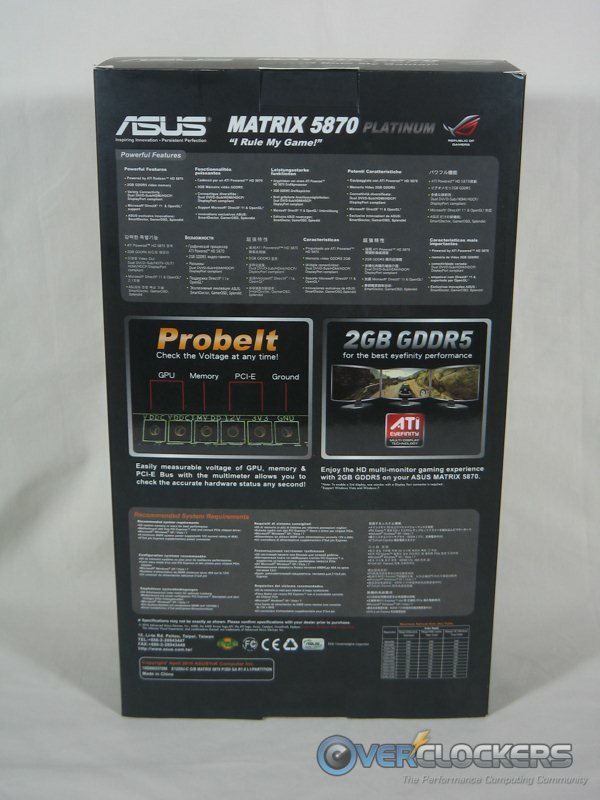 ASUS makes it a breeze to flash your BIOS on this card with, well, with pretty much anything you want. 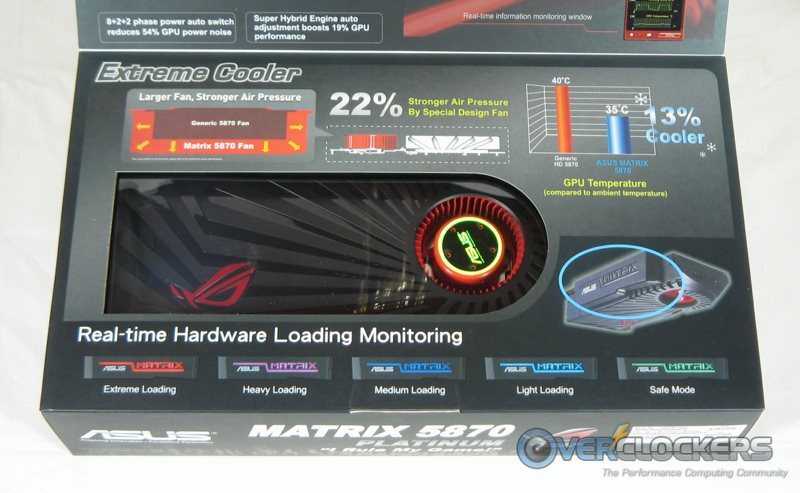 All you do is set your GPU and memory frequences and voltage, as well as your memory timings. Then save them to one of your profiles and select that profile to load it. After that, click on the “Profile Management” button in the bottom left, then click “Detail”. You will then be presented with this screen, showing the settings saved in that profile. When you put your mouse over the graphics card image in the lower right, the arrows you see light up (and are animated). Click on that and after confirming you really do want to do that, it will flash the BIOS for you. That’s all there is to it. Very easy compared to many cards on the market that don’t have this seamless software-to-card interface. What’s even better is that this card has two BIOSes. One that you can flash and the other for Safe Mode. This is a different implementation of Safe Mode referenced earlier. If the clocks you flash to aren’t stable, you can shut down and engage Safe Mode. When you get into Windows, iTracker will detect Safe Mode and automagically copy the Safe Mode (default) BIOS over to the active ROM, bringing your card back to its happy, stock self. Now, it may well be that this is the only implementation of Safe Mode possible. In which case, it was never meant to recover from a bum overclock. I’ll try to find out and the article will be updated accordingly. Now that we’ve got the tools, let’s do a little beating on this card! This card and I got to know each other pretty well over the course of quite a few hours. I started by feeling out the maximum overclock I could get for 24/7 use on stock volts. Using FurMark to stress the card for three minutes after clock changes, I came up with 946 MHz. Three minutes does not mean a card is stable of course, it was just giving a ballpark. After running all benches and game tests, it turns out that 930 MHz on the core and 1218 MHz (4875 MHz quad-pumped in iTracker 2) on the memory was the max 24/7 stable clock this card was capable of at stock volts. That’s not anything to frown about – free MHz with no voltage increases are always welcome! Cranking the voltage sliders all the way to the max, the absolute maximum stable GPU clock that would pass Aquamark 3 turned out to be 1035 MHz on the core and 1273 MHz (5092 MHZ in iTracker 2) on the memory. This was also without touching the memory timings, so I dare say you can do better given more time. 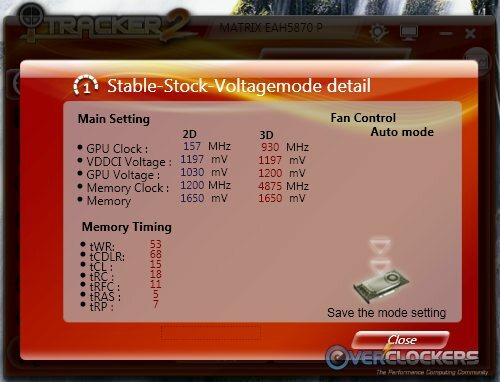 Since stability was still being felt out as I went to benching at stock volts, the core speeds will differ for overclocked-at-stock volts in the results (“Matrix Platinum Overclocked”) below. Since I don’t favor killing operating systems on a regular basis, it’s also important to note that the “Matrix Plat Max OC” results were completed in a benching install of Vista x86 I installed for those purposes. As such, take the max results with a grain of salt – the differences between operating systems is evident in the results of a couple of the benches and definitely had at least some affect on all of them. The more important thing to take away from that is the clocks that the bench would complete at. The 4890 results are included basically to let you see how far we’ve come since the last generation and won’t get any play in the analysis. It’s also important to point out the graphs do not start at zero. This is to highlight the differences in scores, some of which were mere dozens of points away from each other. Unfortunately, due to a problem with voltage adjustments (or lack thereof) on the competing Gigabyte card, it had to be sent back for diagnosis before we could dig into overclocking it, thus all of the results are compared with the Gigabyte at stock clocks only. Hopefully in time we’ll be able to put some overclocking in the mix. Remember throughout all of these tests – the Gigabyte card starts out with a 50 MHz advantage on both the GPU and RAM, a rather significant increase. What the Matrix has in its favor is the extra gig of RAM. Let’s see how those differences pan out, shall we? The Stalker bench is one tough cookie. It actually does a great job of feeling out stability and is what ended up showing us the true final 24/7 stable numbers. The tests were run at three resolutions – 1280 x 1024, 1600 x 1200 and 1920 x 1080. Unfortunately the numbers for the Gigabyte card were run before I had a monitor capable of 1920 x 1080, so it stops at 1600 x 1200. The Matrix’s overclocked speed for these tests were 930 MHZ / 1218 (4875) MHz. Overclocked, the Matrix comes in a very close second to the Gigabyte. This doesn’t necessarily tell the whole story though. At higher resolutions (think multiple monitors), the Matrix’s extra gig of memory would begin to show its worth. 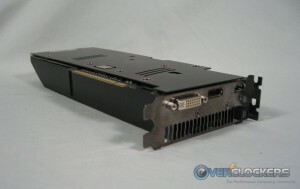 This isn’t an Eyefinity 6 card, with six display port outputs, but it will run up to three monitors. With two gigs of RAM at your disposal, that’s where you’ll see this card shine. 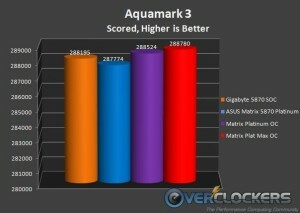 Aquamark is a long time favorite of mine for its quick-running and ability to complete at higher-than-ordinary speeds. 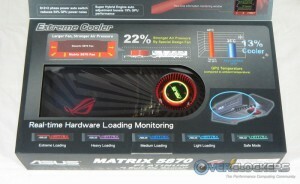 These days it is more of a CPU test than anything, but will still highlight differences in graphics cards. Matrix overclocked speeds for this bench were 930 / 1218 at stock volts and 1035 / 1273 with voltage maxed. 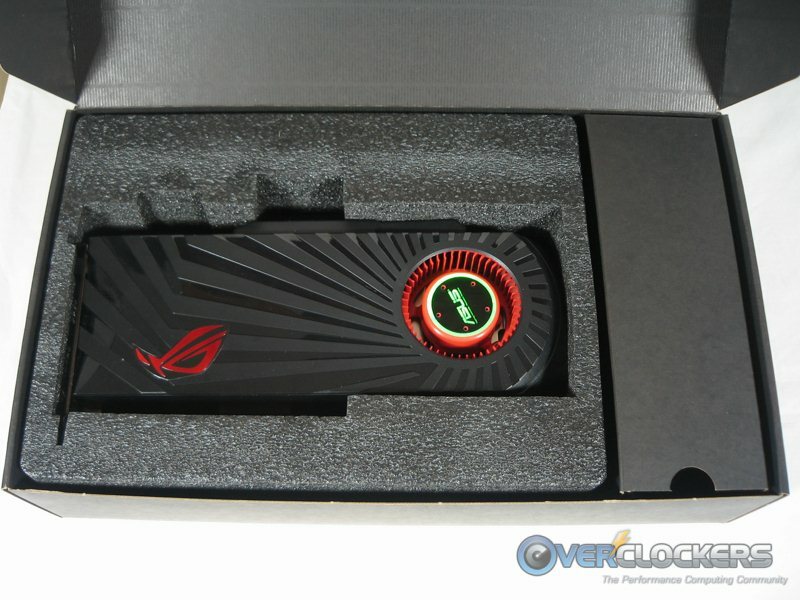 The ASUS card shows off some muscle in this bench for sure. With a 20 MHz core deficit and 32 MHz memory deficit at the stock-volts overclock, it still beats out the Gigabyte card and then just goes up from there when overclocked even more. Tweakers everywhere just adore this bench. Being a brute-force kind of guy, it’s not necessarily my favorite, but I see the appeal. You won’t see any extra tweaks here, just straight run through its paces and done. Matrix clocks for this one were 940 / 1225 stock volts & 1015 / 1250 max volts. First off, we see the blindingly obvious result that Windows 7 beats the pants off Vista for this bench. After you get over that, you see the Matrix, even while still a few MHz below the Gigabyte card manages to come out ahead again. This card is looking better all the time! We’re booking it through the benches now. 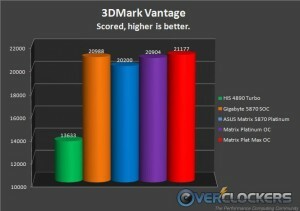 3DMark03 is a tough one on graphics cards and will feel out instability in a heartbeat. Matrix clocks for these runs were 930 MHz / 1218 MHz at stock volts and 1000 MHz / 1250 MHz at max volts. Gigabyte’s offering (and superior stock speed) rule the day in 03. It takes max volts, max clocks and a different OS for the Matrix to take it down in this bench. 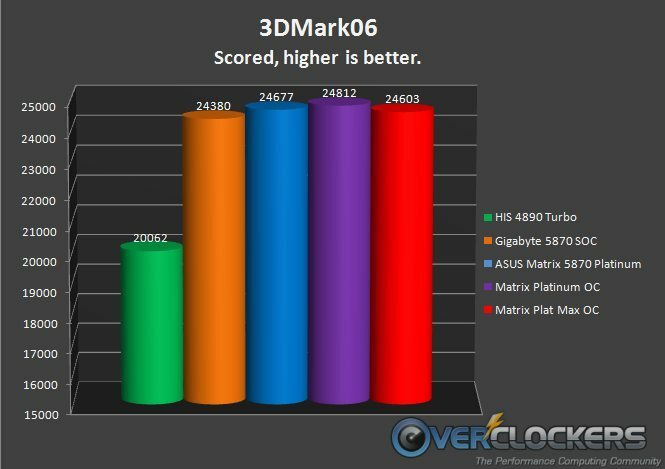 Moving along to the next generation of 3DMark, 05 is another more CPU-dependent bench as you’ll see with the meager differences in clock speed changes below. For this one, the Matrix was clocked at 940 MHz / 1225 MHz at stock volts and 1010 MHz / 1250 MHz at max volts. Overclocked at stock volts, the Matrix is very close to tying the Gigabyte. Overclocked to the max, it handily takes the day, though judging by the almost 1,000 point increase and the CPU-bound nature of this bench, I’m sure the OS had something to do with that. The next-to-most-recent iteration of 3DMark is where they started really pouring on the eye candy. It’s pretty evenly dependent on the CPU and the GPU. This can be a tough one to pass at high clocks too, but not as much as some others. Matrix clocks were 940 MHz / 1225 MHz at stock volts and 1020 MHZ / 1268 MHz at max volts for this one. Its extra RAM helps the Matrix rule the roost when it comes to 3DMark06. Even with much higher stock clocks, the Gigabyte card didn’t perform as well. It started bad and just got worse. Looks like Windows 7 is better for 06 as well. Last, but not least, we have Futuremark’s current (though not for long) flagship – Vantage. This one was equally as tough as 03 to pass and is also very GPU-dependent. 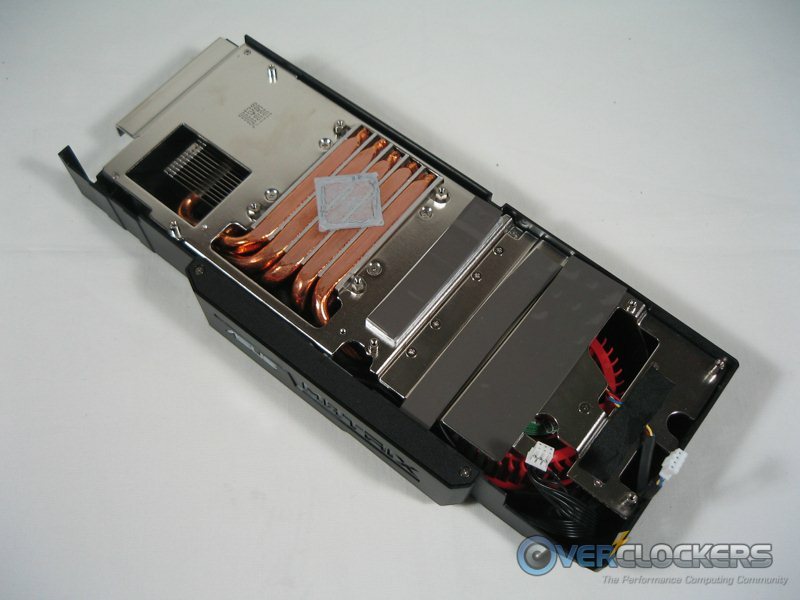 Matrix clocks were 946 MHZ / 1250 MHz at stock volts and 995 MHz / 1250 MHz maxed out. Vantage seems to favor Gigabyte’s higher clocks in this instance, though the Matrix did end up on top when clocked to the max. One thing is for sure, this card was an absolute blast to bench and overclock. The iTracker 2 software made it all the more so. While I didn’t dig into memory timings, that could offer many additional hours of fun tweaking and experimentation. The only drawback as far as performance and features was Safe Mode’s failure to engage. I have no idea why it didn’t work, but it sure didn’t and failed to prevent losing an OS install. Overclocks were pretty solid on the stock cooler. Air can only get you so far of course and if one of these were put under dry ice or liquid nitrogen, you’d undoubtedly see a healthy increase in max frequency. 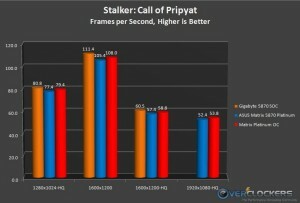 Memory clocks are likely not going to reach heights that cards with a single gigabyte of RAM could simply due to the increased amount. Akin to comparing 4 GB of system memory vs. 8 GB, the former will generally clock higher and do it more easily. 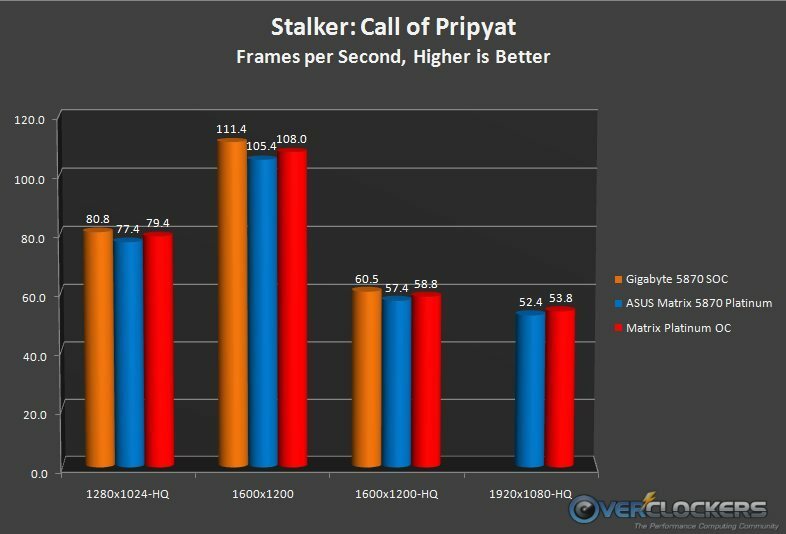 However, in some benches and definitely at high resolutions with multiple monitors, the extra memory will be a strong boon to performance. 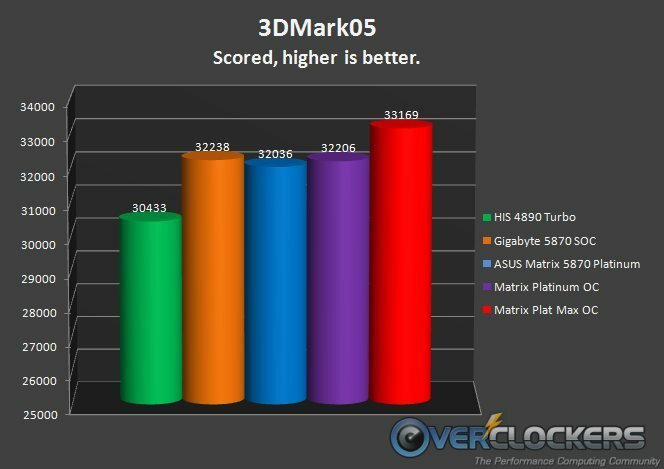 So, we have great software, a strong cooling solution, decent power efficiency and good overclocking. What’s missing? Oh yea, the price. It’s right up there with the top of the heap. 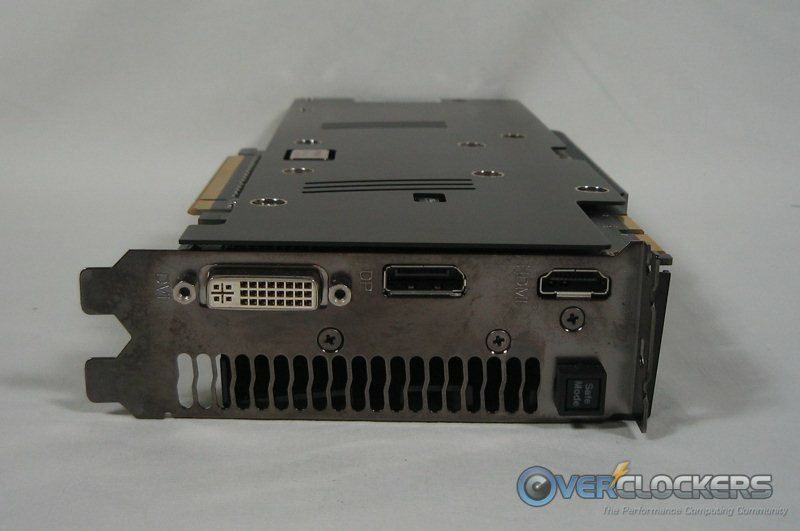 Before rebate, at $519.00 it weighs in at the most expensive 5870 on Newegg right now. Presently though, it has a mail-in-rebate and ends up right where the rest of the pack is – $499.99 with free shipping. The Gigabyte card compared today costs $499.99 as well, but without free shipping. If you currently have or would ever consider going to a two- or three-monitor setup, the Matrix wins that battle hands down due to the extra memory. Considering how close the two are in competition, I’d rather have the extra gig of RAM for the same price. Even at the regular retail price, $20 is worth it for double the memory. At lower resolutions, it’s a tough call; based strictly on numbers it’s a toss-up. 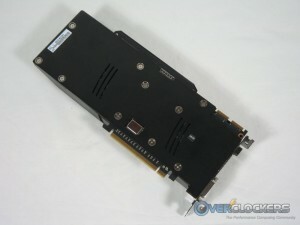 At stock clocks and lower resolutions, the Gigabyte card will put out better numbers overall. 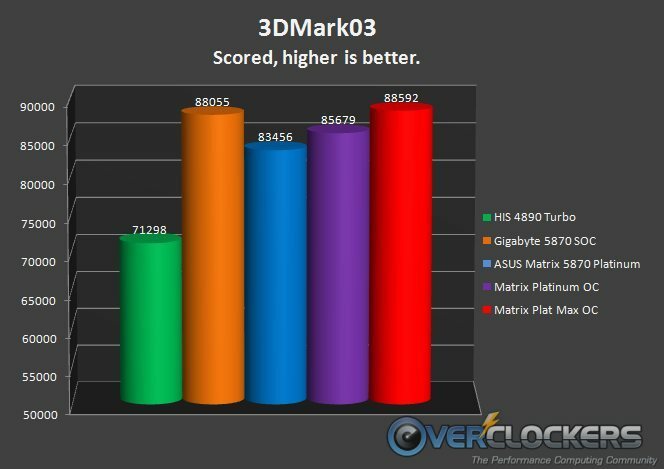 Overclock the Matrix and you’ll see just as good or better numbers. 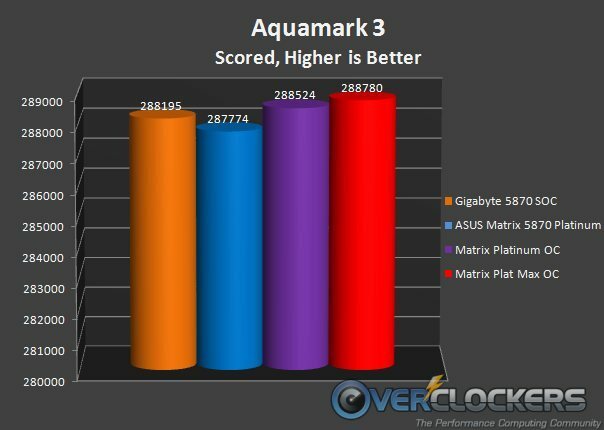 Add to that the seamless ASUS software, a cooler that physically cools the memory (unlike Gigabyte’s) and an extra gig of RAM, then the Matrix is the clear winner, impressive from start to finish. Like Neo, I took the red pill – and I liked it! Thanks to ASUS for supplying this card for review. I love the design of the Matrix, the lit up Matrix on the card is a plus! Great review. I find the use of direct contact heatpipes directly on the die very interesting, that's the first time i've ever seen it. 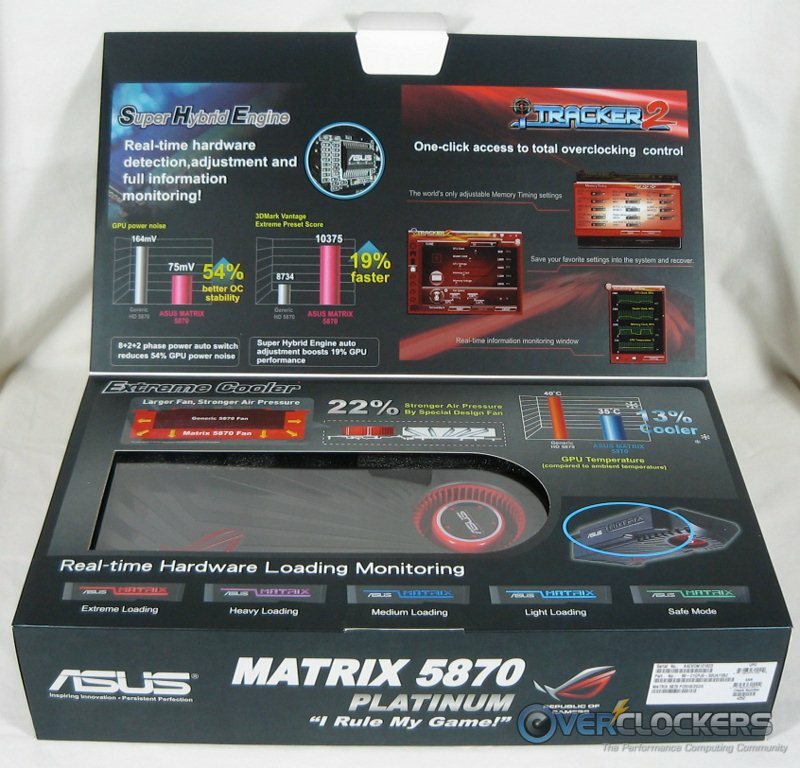 good review its seems accurate to my experience except mine has a harder time Overclocking than his :rain::rain:. I do love the heat pipes i just put some Shin-Etsu paste on it it was the first time i pulled the heat sink off and it was impressive. 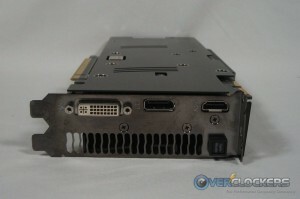 Do you know if the OC software works with other 5870's as well? Thanks! No I don't know actually, and my other 5870 is out right now so they can figure out why I can't adjust voltages. Here's the product page if you feel like downloading & installing it. I got mine in Monday, and have not had enough time to actually play with it. One thing I do know is that this a totaly different beast of a card. 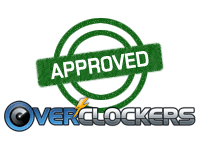 For a general statement, to all those learning about overclocking GPUs, in order to overclock voltage, you have to have a specific Voltage Controller. Not all cards will have this, and each one is different. Most refrence cards will have the right Voltage Controller that Afterburner or RivaTuner will be able to access. 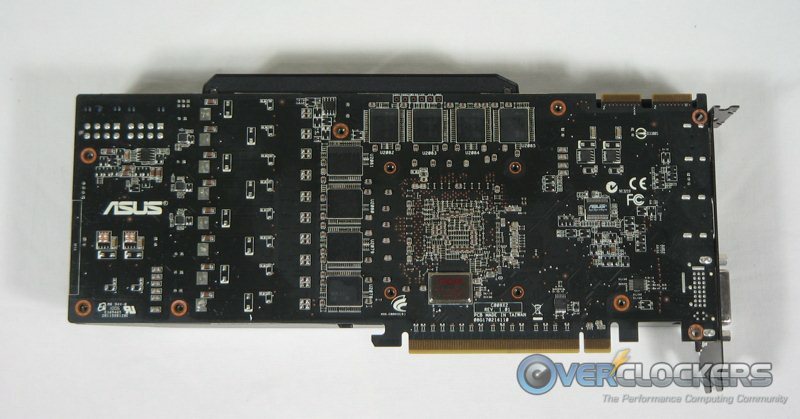 Non-refrence cards ie all ASUS and XFX cards have different VC. Certain cards like the Matrix have a very uniqe VC that allows you to play with the voltages completely without bounds. Others like the EAH5870 or EAH5850 will only allow you to play at a certain level. 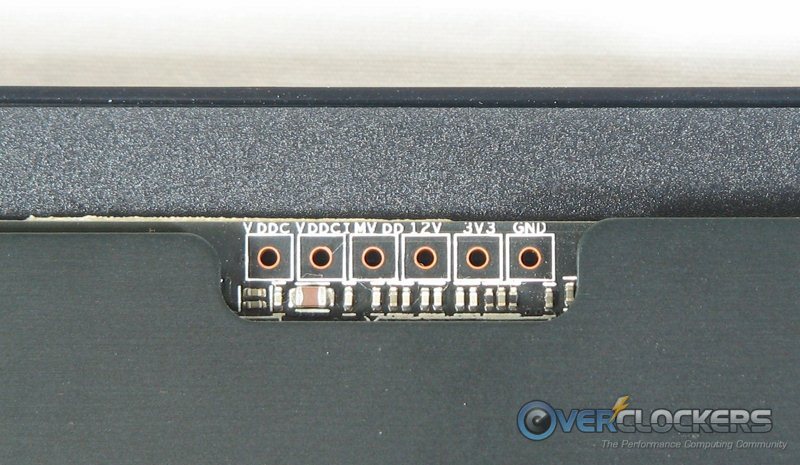 There are ways around VC adjustments by hardmodding or swapping BIOS. Anyway, I'm going to be doing some OCing all night with this bad boy. Going to make it scream like a little pansy. 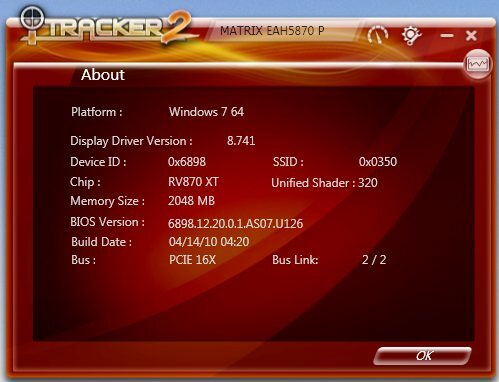 One last note, make sure to use iTracker2 1.6 which can be found under the Windows 7 OS option at support.asus.com. It will not show up for DL under the other OS. And make sure to update your BIOS if you have not. Please please please start a thread and give us some results man!